A seismic wave travels through a planetary body, and bears information about the conditions along its path. Seismic waves are mechanical waves in that the wave proceeds via the direct push of an atom or molecule on its neighbours. Other mechanical waves include sound waves in the air and the ripples on the surface of a pond. 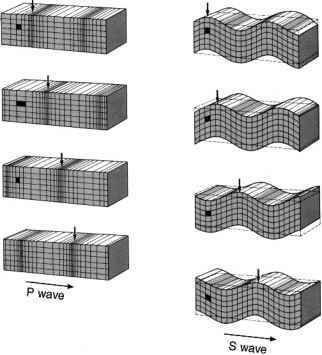 There are several types of seismic wave. Rayleigh and Love waves, rather like water ripples, can exist only at an abrupt change of density, such as at the surface of a planet. But it is two other types that have been of particular value in elucidating the structure of planetary interiors. These types are illustrated in Figure 4.7. In a P wave the oscillatory motion of the substance is longitudinal - to and fro in the direction in which the wave progresses, as in a sound wave in the atmosphere. In an S wave the oscillatory motion is transverse - perpendicular to the progression. S waves require the medium to have shear strength, so they do not travel in liquids or in gases, and they are strongly attenuated in soft, plastic materials. Figure 4.7 P and S waves. The vertical arrows indicate a maximum. are typically only a few kilometres, and seismic waves travel from the source in all directions. For a planet with a liquid core and a solid mantle some typical paths are shown in Figure 4.8. The curvature of the paths is a consequence of the gradual increase in wave speed with depth. You can see that the path bends away from the direction in which the speed is increasing. 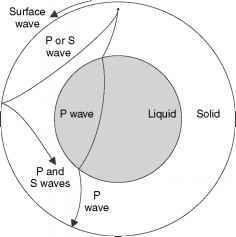 The importance of P and S waves is that they can reach a considerable depth in the planetary body. For example, in Figure 4.8 the P wave that enters the liquid core passes near the centre of the body and reaches the surface on the far side. If it is detected there, and if we know the source position and the time that the wave set off, we can calculate the average speed of P waves along the path. □ If P waves set off at time t1 from a shallow depth, pass through the centre of a planet with a radius R, and are detected at t2 on the opposite surface of the planet, what is their average speed? The average speed is the total distance divided by the total time: 2R/(t2 - tx). If average speeds are determined for many different paths, then we can deduce the P wave speed at all points in the interior, and not just as an average along a path. A similar feat can be performed for S waves. What can we learn from these data? It is beyond our scope to derive this equation, but you can see that it depends on a and p in a reasonable way. Thus, if the material is less deformable then a is larger and it passes the wave along more rapidly. On the other hand, if it is denser then it is more sluggish in its response, and the wave travels less rapidly. For S waves the speed is given by where r is a different modulus, called the rigidity (or shear) modulus. 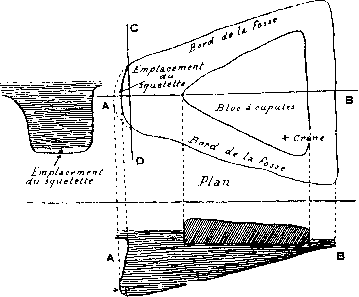 This is a rapidly applied shear stress divided by the resulting shear strain (Figure 4.7). Equations (4.9) and (4.10) show that if we know the P and S wave speeds at a point in a material then we know something about the density and the elastic moduli there. Materials differ in these properties so we seem to have valuable information on composition. Unfortunately, because we have just two pieces of information - S wave speed and P wave speed - but three unknowns - density and two elastic moduli, we cannot deduce the density and the elastic moduli. Therefore, we have only a weak constraint on composition. Tighter constraints are obtained by combining seismic wave speeds with gravitational and other data. The outcome is that the density versus depth is strongly constrained, even deducible with sufficient data, and this provides a strong constraint on composition. absence of S waves over that range. Also, if the S and P wave speeds change suddenly at a certain depth, this is a strong indication of a change in the minerals present, either in their chemical composition or in their crystal form. For a body that is fluid throughout, seismic wave speeds can be obtained from the Doppler effect of the wave motions on visible spectral lines in the radiation from the body's outer regions (Section 2.1.2). In the case of the Sun such studies constitute helioseismology, a well-established technique that has yielded much information about the solar interior. Developments are under way to apply a similar technique to spectral lines in the outer atmospheres of the giant planets. To obtain the P and S wave speeds versus depth requires a large network of seismic observatories well spread over the surface of a planetary body, with data from a large number of seismic sources. This has only been achieved for the Earth, and Figure 4.9(a) shows the P and S wave speeds versus depth in our planet. Layering of the Earth is also indicated by large changes in the wave speeds over very short depth ranges, and these generally indicate changes in composition at these boundaries. Between these boundaries there is a general increase of speed with depth. Given that the density in planetary interiors increases with depth, this would seem to be contrary to equations (4.9) and (4.10) which show a decrease in speed for an increase in density. However, it is also the case that the elastic moduli of most substances increase with an increase in density (though decrease with an increase in temperature), so the outcome is not obvious in advance. The seismic data are so extensive for the Earth that small changes have been detected in the wave speed profiles, and some of these correspond to slow convective motions within the various layers. Figure 4.9(b) shows the P and S wave speeds versus depth in the Moon, the only other body for which there are seismic data at present. These are from seismometers set up at the landing sites of Apollos 11, 12, 14-16 (Table 4.1). The large uncertainties shown in the speeds are the combined result of only having these five seismic stations, their being located all on the near side of the Moon, some not working very well, and 'moonquakes' being much less frequent and on average weaker than in the Earth. The speeds in Figure 4.9(b) are averaged over profiles obtained by several seismologists. Every profile shows an increase in P and S speed with depth, as does the average, but the averaging has obscured evidence in most profiles of small, but sharp, changes at a few depths. The data in Figure (4.9) will be further interpreted in Sections 5.1.1 and 5.2.1.